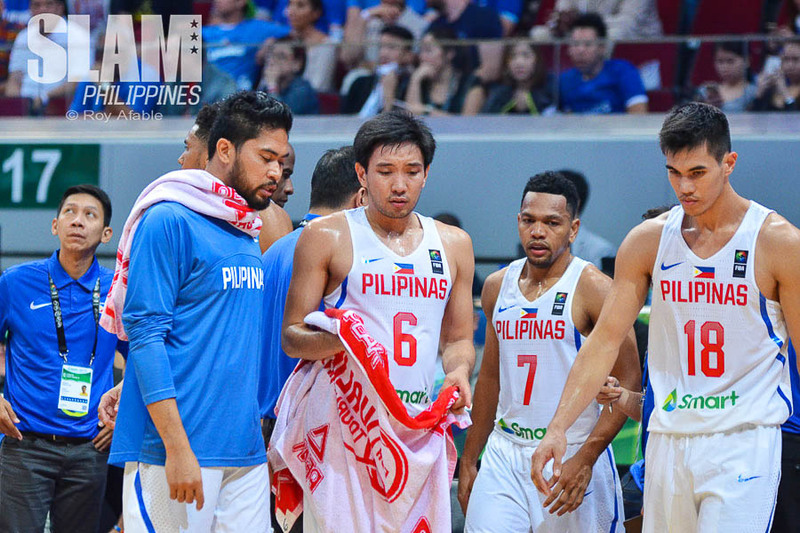 Sumalangit nawa: The death of the Gilas moral victory. In any language. Sayang. Almost. Muntik. Halos. Not quite. 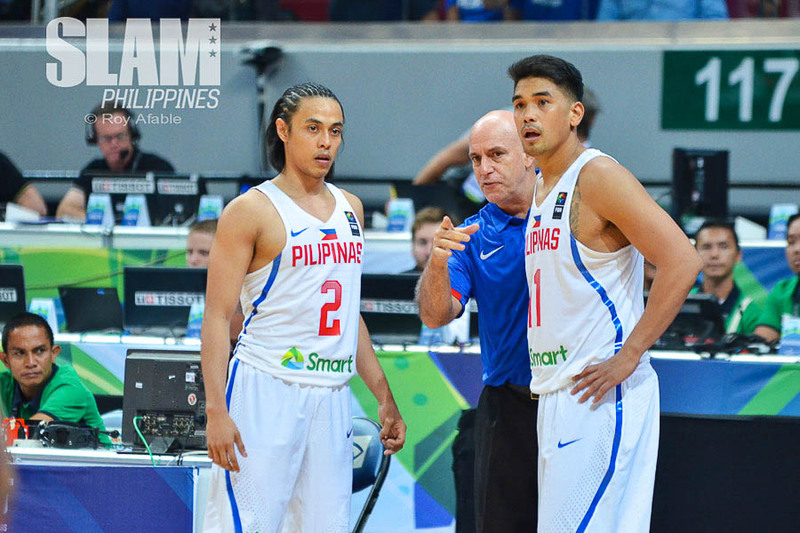 There is an abundant selection of words, both in English and Filipino, appropriate for the Gilas supporter after two losses in the FIBA Olympic Qualifying Tournament. That last one, though, is undeniable. 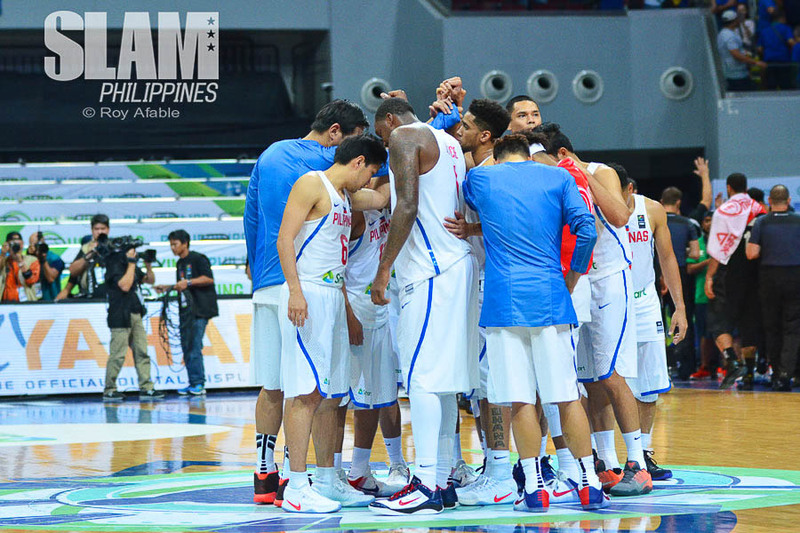 Maybe for the first time in Gilas history. 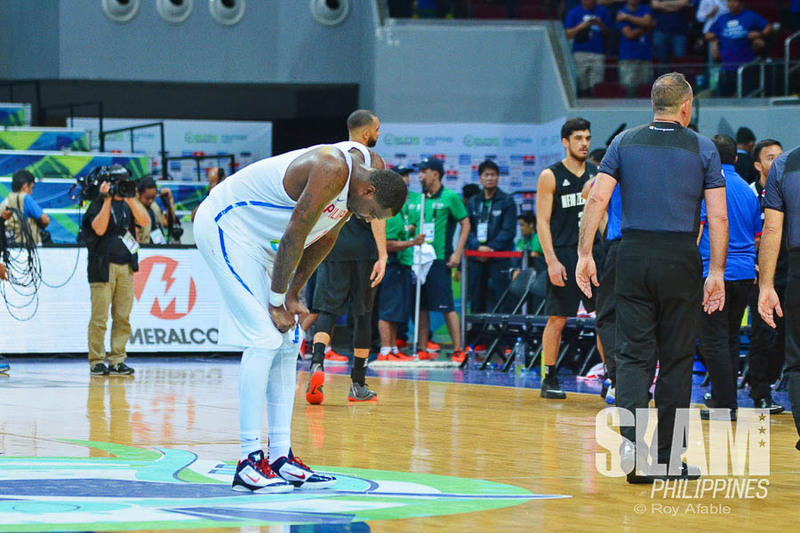 Yes, it was a loss that ended the FIBA Asia campaign, last time our boys competed in front of a home crowd. But that was against Iran, without Marcus Douthit, after ending the Korean curse, ensuring at least a silver and most important of all, a World Cup berth. Yes, that tournament ended in a loss. Even as I write about that oft-forgotten gold medal game (which I was in the stands for, but still can’t remember much of), all I can recall is the night before: Jimmy’s big three, Larry falling to the floor, the thousands of people in the arena high-fiving and hugging strangers. In fact, as I saw Hamed Hadadi and company receive their medals and stuffed toys, all I could think of was how much I would have to save to maybe make it to Spain. I was happy. We all were. It was a loss. But not really. The World Cup campaign was riddled with losses, all but one actually. But again, parang hindi. We pushed Argentina, pushed back against Greece, and eventually got our win against Senegal. We did not advance. Scoreboards said we were defeated. Pero parang panalo padin. We were supposed to be blown out, but we hadn’t been. We fought back, lumaban, pumuso. And we welcomed our guys home with one World Cup victory in our mouths, enough to wash away the results of every other game played in Seville. We shocked the world. Nagpakilala tayo. Panalo parin. Di tayo natalo. Dinaya tayo. The other night, we lost. The night before that, we lost. This time, there are no more moral victories, no more justifications, no more delayed buses, or injuries, no more silver linings. Pwede na yan. At least. Di na masama. Kesa naman ganto. Buti hindi ganon. Ok nako dito. All that? In both languages? Now, we slowly realize, here it is, another loss. This one maybe the realest and most difficult to accept because of the lack of a storyline to make you feel better at night. It’s just a loss, two of them, right in the heart of Pasay too. Now this is not to say Gilas wasn’t impressive for stretches, or that June Mar’s emergence wasn’t welcome, or Andray’s puso wasn’t so glaringly obvious. All that, and much more, stand to be true. This campaign is not without its positives. However, it is important to understand how our reaction to this failure, both knee-jerk and contemplated, reflect our program’s place in its own existence. We feel these losses more than the ones before because we understand now that we can win, at some level, maybe we even should win. Our basketball is at a level now where we don’t shock anyone anymore, wala nang gulpi de gulat. They know who we are, they know what we’re about, they know Dray will dribble behind his back, Jeff will shoot three’s, and Terrence will Terrence. And yet, still, we’re in positions to win. We’re that good. And trust me when I say, oh hot damn we’re good. The sting however, comes from the obvious: we’re still not good enough. Stripped of an excuse to wield, a first-timer’s limited expectations, and a rookie’s low standards, we now face the lay of the land as it is, plain and clear: as much as we’ve improved, they’re still better. And when you have to stand there and accept that, and only that, and take little comfort in tiny victories that become harder and harder to find, it hurts. And that’s for us sitting in the stands. Imagine the guys in uniforms. The way we process this, however, will define us. So it is advisable to proceed with caution. In life and in basketball, it is as much a disservice to be blindly supportive without evaluation, as it is to be critical and sharp-worded just for the sake of having something to say. To patronize in the name of nationalism is just as insulting as an insult for the sake of sounding cool. The greatest achievement our program has produced is that it has earned for itself the right to be evaluated objectively. Like all the top teams in the world we used to look up to, we are now in that club. Our players, our coaches, they understand that to sit at the adult’s dinner table means having to make adult decisions. We are nobody’s little brother anymore. Our mom isn’t throwing a party just because naka-shoot tayo ng isang beses sa liga. Nobody’s clapping their hands saying “It’s okay, nice try” anymore after we shoot an airball. Hell no. We wanted to put ourselves on the map, and here we are. This is a new world, a new day. And it’s not always fun. It’s not fun for the players who, yes, have to ponder retirement, and watch tape of missed defensive plays, or broken offensive possessions. They’ll have to take responsibility for those. And they will. It won’t be fun for Coach Tab and his staff, who will have to look at the numbers, realize they never lie, and deal with a gamble not paying off, or a strategy not working. They’ll have to own up to those. And they will. My bad. Sorry. Akin yun. On me. This is a plea for understanding. No, we weren’t perfect, yes, mistakes were made, and finally, our team, for better or for worse over the past few years, has bought for us the gift and the curse, of objectivity. It’s a thin line, I know. A difficult one to tread, balancing passion, pride (for country, which is incredible, and for self, which is just sad) and an inextinguishable love for the game. But hey, if Terrence can play in the most important tournament of his life rocking Bora-braids, then we too, can do anything. When Gabe Norwood, captain of Gilas, in service for a decade now, sat in the press conference after the game, he was fighting tears. Battling them, more than he’s ever fought before. This man was in a duel to the death with perfect, round, heavy tears, formed and ready at the corner of his eyes. When he spoke, the tears stabbed him in the side, not enough for him to lose the fight, but man it sure looked like he was a goner. He hung in there, Gabe did, in his deathmatch with crying in front of the media, the cameras, the nation. I betrayed him by asking another question, delaying the inevitable, prolonging the pain. He powered through, though, ‘til the end. He stood up, thanked everyone in the room and said “God bless,” as he always does, albeit with a voice so faint, so cracked, you knew every cell in his body was focused on keeping the Maria Christina from falling from his eyes. He lost that fight. Probably more than once that night. We didn’t have to see it to know. But not when he needed to be strong. Not when he sat there after a scoreless game, opening himself to criticism, taking the blow for his teammates, because that’s what captains do. That’s what decent people do. Maybe, even, for the last time. Gabe and Tab Baldwin spoke that night about the process, how this, difficult as it may be, is part of getting better. May we understand that it’s a process for all of us too. As much as we need to shoot better from the outside, move the ball more, and cover pick-and-rolls at a higher level, we also need to watch what we say, and check our clocks and understand Manila traffic. We need to know what color shirt to wear, we need to understand that tickets shouldn’t cost an arm and a leg. We need to be more sensitive of other people’s cultures, we need to sing our anthem’s words, and have facepaint more readily accessible, and have something other than the wave to show our love as a crowd. Our team will get better. Haven’t they proven, above everything else, that they always do? Will we, the isolation-hating, finger-pointing, conspiracy-loving, expert-analyzing fans of a team that yes, must be judged with the full harshness (and fairness) of objectivity, rise to the call as well? It’s a process. We’re all in it. Not because we’re inspired to be. That’s easy. But hopefully, because we want to be. That’s tougher. But it’s necessary. It’s what is asked of us, it’s what is most difficult to provide: to remain strong, remain together, in the face of defeat. That’s what captains would do. That’s what decent people should do. Trust. Laban. Faith. Maniwala. #Tiwala.